We first did this toilet paper roll octopus back in 2010 with the elder brother. Today we did the same with the little brother but skipped the painting part so it is not too lengthy. Watch this video on how your toddler can make an octopus out of a toilet paper roll. If you intend to use kitchen roll, you’ll have to cut it short accordingly. The hot spell brought many leaves to the ground and what better way to appreciate them then by making a leaf stamping art? All you need is lots of leaves, paint brush, tempera paste and a piece of paper for stamping on. We used plastic egg cartons to store paints and empty drink bottles to wash the paint brush. We try to recycle stuffs before disposing them. My boys have too many cars. They are everywhere. We built a multi-level toy car garage using large toilet paper roll last weekend. All we need are many huge toilet paper rolls and a thick board to support it at the back. Paste double-layered tapes on the rolls and stick them together. After a long hiatus, we are finally ready to craft again as my little boy is turning two next month. Let’s make a toilet paper roll apple tree today. We’ll need a toilet paper roll or a kitchen towel roll, brown tempera paste, green and red crepe paper. Paint the toilet paper roll. Do not cut it into half yet as it is easier for your toddler to hold it if it is still whole. Tear and crumple the green crepe paper. Smear glue all over a construction paper. Paste the green crepe paper. Add red crepe paper as the apple. Cut the toilet paper roll half and paste as the tree trunk. Chinese New Year is just one and a half month away so let’s start making CNY decorations using red packets. For this Red Packet lantern, we’ll be needing TP Rolls too for the core. Wrap the TP Roll with red craft paper. Using only the front part of the red packet wrapper, cut lines down leaving a cm uncut on the top and bottom part. Paste it on the TP Roll and decorate with dangling ornament. This is a really fun craft that doesnt require any fancy materials. You’ll most likely have everything already at home. It’s also ‘magical’ and I’m sure your kids will love it! Fold a coloured paper half. Draw one half of a butterfly making sure the top wings are way above the butterfly head to enable it to balance. This is also a good time to teach your child about the centre of gravity. Cut and paste onto the card board. Cut again. Paste a coin each on the back of the top wings. The butterfly should be able to balance itself now. It can balance almost anywhere. Your kids will have a whole lot of fun balancing the butterfly everywhere! You can also make a balancing bird instead of a butterfly. We’ll be making an extremely simple handphone charger holder out of milk carton today. Cut an empty milk carton into the above shape and decorate as you wish. Your simple handphone charger holder is done! Let’s go sailing! We’ll be making a sailboat out of milk carton today. Cut into half. Paste colored tape all around it. Use a chopstick and paper for the sail and tape it onto the sailboat and it’s done. Simple! Two months old chili plant in its self-watering pot. 3) Place some strips of cloths and add soil. 5) Add seed and place container in a shady yet with enough sunlight area. 6) Wait and watch your seed sprout! It has been 2 months since we started this project and we only changed the water twice. The water never runs dry yet we changed it to get rid of the moss in the water. 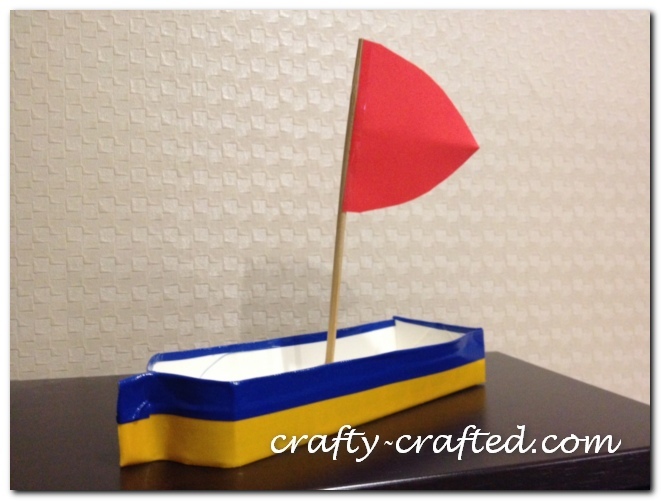 This is a great school holiday crafts for kids. Today we will be transforming a simple plastic bottle into a cool Airplane Pencil Case. – Slit open an empty plastic bottle. – Glue paper all over the entire bottle with the last layer being plain white paper. Paint the airplane and glue a 20cm zipper around the opening. We were walking in the park when we noticed lots of dried leaves scattered around. I picked up several nice ones and brought them home. 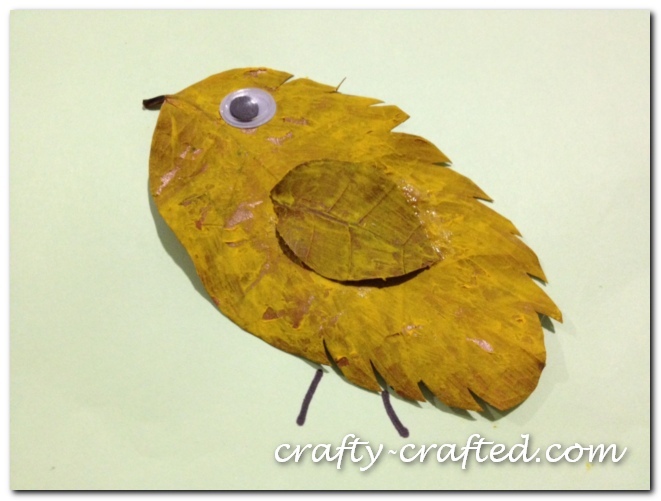 Today’s craft is Dried Leaf Chick. You’ll need 2 dried leaves of different sizes. Paint them yellow (using acrylic paint) and let dry. Paste the smaller leaf onto the bigger one as the wings. Use a marker pen to draw the feet. Chinese New Year is approaching fast and we are ready to welcome the year of the Snake. Let’s make a snake out of egg cartons today. Just cut the egg cartons into individual cups and paint green. Paste googly eyes and tongue (cut out of felt or angpow wrapper). Paste dots on the body. Punch a hole and tie a string through the egg carton cups. It’s been some time since our last papier mache project so let’s make one today. Cut an S shape out of a hard board. Roll some old newspapers and secure them on the S template using masking tape. Repeat on another side. Use masking tape and tape all over the newspaper. Tear old newspapers. Soak them in water. Apply PVA glue and paste all over the masking tape. Repeat several layers. Let dry. Besides CDs we also have lots of these eco-friendly shopping bags. Too many of them in fact! So I decided to recycle them too! Use the CD as a guide and draw a circle on the black shopping bag. Draw another circle on the red shopping bag and cut. Paste the black circle cut-out on the CD. Cut the red circle into half and paste. Cut smaller black circles and paste on the wings. Add the back, paste used clothes peg and a magnet over it. I think the only items you needed to purchase is the googly eyes and magnet. The rest are totally from the cabinet! Stamp it onto a piece of drawing art block. Cut the eyes and beak out of an egg carton. Paint the eyes and beak. While waiting for the egg carton to dry, paste some feathers on the handprint. We’ll need a large toilet paper roll, a sauce cup, a straw and a rubber band for this craft. Glue the toilet paper roll onto a cardboard. Paint the toilet paper roll. Draw circles. Use paper punch to punch out smaller circles out of black craft foams. Paste. Paste everything onto the toilet paper roll and let dry. 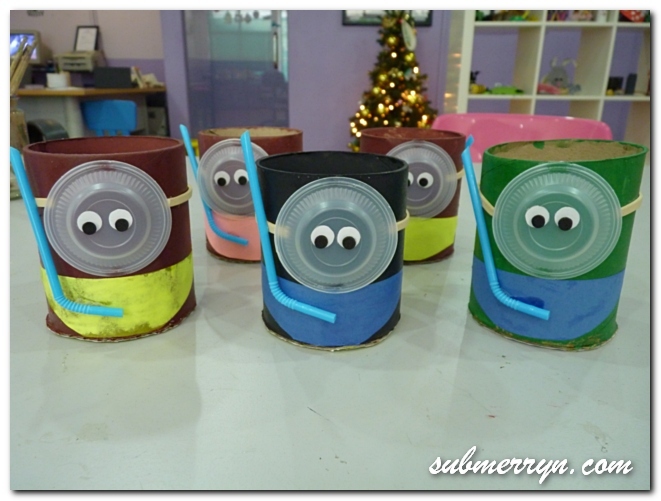 Little cute toilet paper rolls ready for some snorkeling fun! I’ve always loved the fine art of pottery. I wish to try pottery with the students but I can’t find a good enough clay yet. We will need a large toilet paper roll. Glue a cardboard at the base and let dry. We’ll need lots of strips of crepe paper. Twisting crepe paper is good to train the little kids’ motor skills and coordination. Apply glue on the toilet paper roll and paste the twisted crepe paper, rolling and repeating with new strips of paper until you’ve covered the entire roll. The kids busy with their masterpiece. The completed crepe paper pencil holder. Another kid did this creative BEE! Yvonne of MyDiaryMyBlog shared with us this cute craft made by her kids from recycling old buttons taken out from old clothings. All they needed were old buttons, UHU glue, sequins and soft wires. This craft requires adult’s supervision as buttons and tiny sequins are being used. Please ensure the little ones do not put them into their mouth. Thank you Yvonne for the lovely craft out of recycled items. Click here for the full entry.